Back in the middle of 1988 F1 teams were mentioning Johnny Herbert's name in much the same way that they would talk of Michael Schumacher's in 1991 and 1992, for the Englishman was most definitely seen as the comingman of motorsport.Another product of the British karting system, he had taken to Formula Ford 1600 and 2000 brilliantly in the uncompetitive Quest chassis. Victory in the 1985 Formula Ford Festival marked him as a man to watch, and he justified the faith of his backers by winning the British F3 Championship with ease in 1987. A year later he won his first F3000 race, at Jerez with similar insouciance. In between, his pace while testing a turbocharged Benetton-Ford at Brands Hatch had prompted a spectating Nigel Mansell to ask just who was driving the car so quickly. When Herbert later tested a Lotus at Monza, the team had to ballast it with fuel to stop him embarrassing team leader Nelson Piquet.Frank Williams was at Brands Hatch in August 1988 to watch Herbert racing in F3000, a contract in his pocket. But that day the Briton was involved in a heavy accident triggered by the controversial Swiss driver Gregor Foitek, who earlier in the year had left Herbert concussed after pushing him off the road at Vallelunga in Italy.Herbert was lucky not to have one of his shattered feet amputated, yet stunned doctors with the speed of his recovery. Peter Collins, formerly the team manager at Williams, had kept a Benetton seat open for him, and Herbert did it justice by finishing fourth on his F1 debut at Rio early in 1989.Behind the scenes, however, politics reared their head as Flavio Briatore was brought in to reorganize the team. Herbert's feet were still sore, and at circuits such as Monaco he was unable to brake hard enough. Briatore lost no time sacking him, though his replacement, Emanuele Pirro, was slower.Herbert floundered, with sporadic outings for Tyrrell and Lotus in 1989 and '90 until Collins, now running Lotus, rescued him again in 1991. In 1992 he proved as quick as Hakkinen, but unluckier, and where the Finn escaped, he could not extract himself from a long-term Lotus contract. When the British team finally collapsed, Herbert had switched briefly to Ligier and thence to Benetton, where he finally won not just his first but his second GP in 1995. 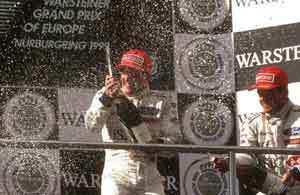 It was an unhappy season otherwise, however, even though he was fourth in the World Championship, because his teammate was Schumacher, and the team revolved around him.At Sauber, Herbert proved himself as fast as Heinz-Harald Frentzen and Jean Alesi, but few rated him as he moved to Stewart for 1999. Initially he was outclassed by Rubens Barrichello, but then he got the car working to his satisfaction and turned the tables on the highly rated Brazilian. To cap it all, he scored Jackie Stewart's 28th GP success with a remarkably shrewd and calculating drive in the GP of Europe at the Nurburgring. Despite this Herbert could not find an F1 drive in 2001 and so took on the role of being the Arrows test driver, although he did not do much mileage because the team was short of money. He raced for Audi in the United States and tried to qualify for the Indianapolis 500 with a new outfit callled Duesenberg Brothers Racing but had to call it off because of a clash with a sports car event at Sears Point. In 2002 Herbert continued with Audi and won the Sebring 12 Hours and did well at Le Mans and for 2003 was named as one of the Bentley drivers for the classic French event.